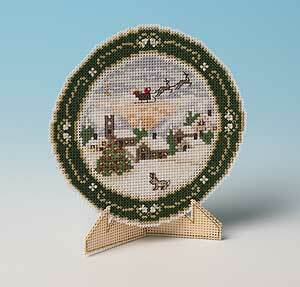 A unique cross-stitch Christmas card kit which makes a card in the shape of a decorated plate on a stand. A stitched Christmas message is on the back of the plate. Kit contains 14 count perforated paper, backing paper, envelope, DMC stranded cotton embroidery thread, tapestry needle, cross stitch chart and full instructions.